4 for $100 treatment packages available during April! Let’s clear up some misconceptions about this healing practice. 1. People think acupuncture is too expensive. 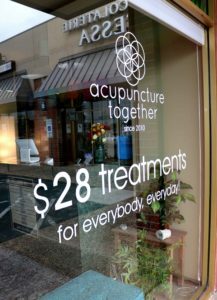 It’s true that there are many clinics that charge $75 – $125 for a single acupuncture treatment. It’s also true that there are places you can be treated for $40 or less. Community acupuncture clinics (like ours) and internship clinics at acupuncture schools usually charge anywhere from $15 – $40 per treatment. Our rate is $28.00 per treatment. Periodically, we sell 4 for $100 treatment packages which brings the rate down to $25.00 per visit. 2. People think acupuncture is painful. In general, acupuncture is a mostly comfortable experience. The large majority of people who receive acupuncture do not experience pain. Occasionally, one of the needles might hurt a little, but it can be removed or replaced with one that feels better. No acupuncturist wants their patient to feel discomfort, so tell your acupuncturist if a needle bothers you after the initial insertion. At Acupuncture Together, we use some of the thinnest acupuncture needles on the market. Most people who visit our clinic do not experience any discomfort when receiving their acupuncture treatments. 3. People don’t know what acupuncture can help them with. If you are interested, give acupuncture a try! It doesn’t have to be expensive, it probably won’t hurt, and it will most likely help you feel better. More and more, people are discovering the power of acupuncture for healing both mind and body. Every cell of your body has an energy or life force to it that has its own natural, healthy vibration. Sometimes our vibrations get out-of-whack, causing dis-harmony or dis-ease. This can affect us physically, mentally, and emotionally. Acupuncture is regarded as energy/vibrational medicine because energy is moved. Blockages are released and a balanced free flow of life energy is restored. In the early years of my acupuncture practice, I found I did not feel good about treating patients one at a time in a room by themselves and charging $75 per treatment. It seemed most of my patients could not afford to come as often as they needed to get better and stay better. Something about that just did not feel right to me. I learned about the community acupuncture business model and changed my business structure. I offer 45 minute personalized acupuncture sessions in a peaceful community room. These sessions help to bring the energy of your being into a more harmonious, balanced vibration. Because multiple people are having their treatments at one time, I am able to keep the rate low – at $28.00 per session. I’ve been providing acupuncture treatments this way since 2010. I am continuously amazed at the affects that acupuncture has on the people that visit the clinic. The power of stillness, a peaceful environment, and tiny needles inserted into certain energy points on the body help quiet mental chatter. People sleep better. Pain dissipates. Allergies and sinuses improve. Skin looks better. People are in better moods and have mental clarity and more energy. I enjoy being in a peaceful room full of relaxed people. I like knowing they will feel better when they leave and that the skills I have as an acupuncturist help facilitate this. Weekly acupuncture sessions will improve your life. You will have more energy, sleep better, handle stress better, and be in a better mood. You will feel better physically. You will just feel better! Community acupuncture means providing acupuncture treatments in a group setting at a low cost. Acupuncture works better when treatments are provided frequently enough to make a real change. The group setting allows us to charge a lower rate, and makes it affordable for most people to get the number of treatments they need to feel better. Since the 1970’s, acupuncture in the U.S. has been mostly practiced one on one. The patient is probably lying on a massage table in a room by themselves. This way of giving and receiving acupuncture makes it costly. Patients may pay $65 – $125 per session. In the early 2000’s, an acupuncturist in Portland, Oregon begin treating people (neighbors and friends) at the same time in her living room while they sat in chairs. If acupuncture usually costs $100 per treatment, why not charge $25 each and have 4 treatments going at once, all in the same room? This morphed into her and her partner renting a space and opening a clinic specifically to practice acupuncture in a group setting. Acupuncturists around the country began hearing about this way of running an acupuncture clinic and started copying the model. Now there are around 200 community acupuncture clinics in the U.S., and some in other countries too. At Acupuncture Together, we have nine comfortable recliners in our group treatment room. There will be up to eight other people quietly receiving their treatment in the room with you. While the acupuncture needles are in place, there is nothing to do but breathe and relax. A group treatment room is supportive of this. Although there are others in the room, it is very quiet. Patients do not talk to each other. People’s eyes are closed. Everyone is in their own peaceful, relaxed world. Often, people fall asleep. Patients remain clothed while they relax in comfortable recliners. Treating patients this way has many benefits beyond being affordable. The group treatment room creates a collective healing energy that enhances the power of each individual’s treatment. Many people find it comforting to have others around them rather than being isolated in a private room. And, it allows families and friends to get treatments together. We are part of a growing movement of community acupuncture clinics around the country that are practicing this business model. If you would like to find a community acupuncture clinic in another city for your family or friends, search for “your city community acupuncture” in a web browser. Any clinics in that area should come up in the search results. Copyright © 2019 Acupuncture Together Austin, All Rights Reserved.